My Dad and I love burgers, especially burgers that are homemade. He began telling me about this burger he made before I went to visit him in preparation for a little road trip. My dad said it was the best burger he had ever had. That is a big statement from coming him because he has been making burgers all his life and he doesn’t give high marks for food unless it is really special. 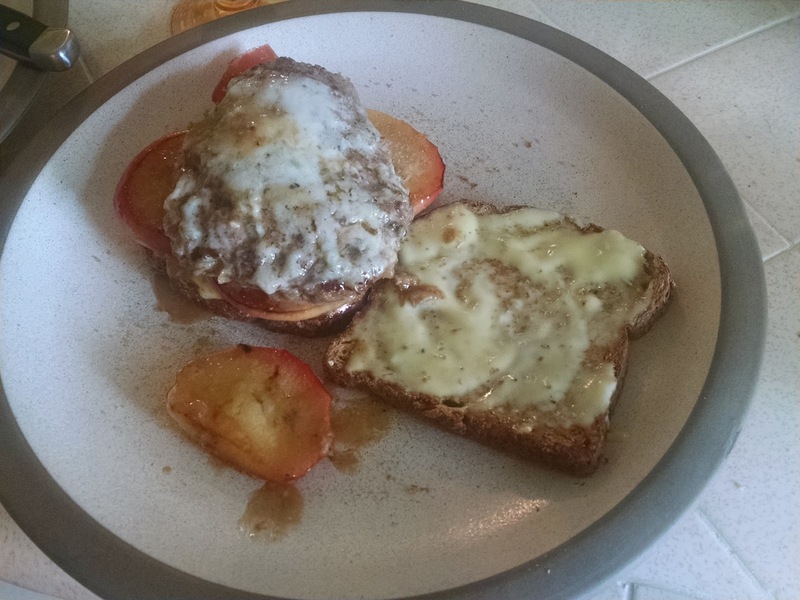 So when I arrived and we started talking food, I asked him what was in this burger and he replied with, “The burger uses buffalo meat, gorgonzola cheese, apples, and brown sugar.” My jaw just about dropped to the floor and I shot him a sideways look trying to comprehend what I had just heard. “Brown sugar?” I asked. Without batting an eye he nodded and said that I wouldn’t be disappointed. Although I couldn’t believe what I was hearing, I had to find out about this burger. Let me say this right now, I wasn’t disappointed. Disclosure: Before we go much further, I just want to say a quick couple of things. First, this is a very rich burger and isn’t friendly to the waist. However, this is a specialty burger and it will change the game when you think about burgers all together. Don’t worry, this isn’t something that I would make every day as my lunch. As much as I would love to do that, this would not be good for anyone. My approach to food is all about moderation. Therefore, it is okay to splurge once in a while and enjoy some crazy food. Ready to keep reading? Here we go! With that, he threw a package of ground buffalo into a bowl with some previously sauteed onions. He very gently worked the onions into the meat to avoid the mixture getting tough. This would allow the burgers to be nice and tender once they were cooked. Then he shaped the burgers into patties between a quarter to a half pound. We went big! You can certainly make smaller patties if you choose. In a saute pan he added a few tablespoons of canola oil, turned the heat to medium heat and waited until the pan was hot. How do you know it the pan is ready? You should see little wisps of smoke rise off the pan. Don’t forget to season the burgers with salt and pepper before you put them down in the in the pan. He placed the patties in the pan and didn’t touch them! Yes, don’t touch the patties. Why? Well, like any other meat, we need to let the meat caramelize and get that beautiful color on the outside. If you are pressing, poking, prodding, and moving the patties you won’t allow the crust and flavor to form. Again, don’t touch! Okay? While the patties were sizzling and crackling away, I was tasked with cutting planks off some apples we had around the house. We were using granny smith apples and a sweeter red skinned apple as well. Just use whatever apples you like and that will be just fine. After the burgers had cooked for a few minutes and formed that crust, we flipped them over, and added the apples to the same pan. He explained we just wanted to soften the apples a bit, but we wanted to have some texture as well. After he had sauteed the apples for a couple of minutes, he sprinkled the apples with a little brown sugar before he flipped them over. Finally, we added some brown sugar to the side of the apple that hadn’t had any sugar and just allowed that to caramelize another minute. He pulled the apples out and set them aside. At this point, the patties were just about finished and ready to be rested–like what we do with any other meat based protein. 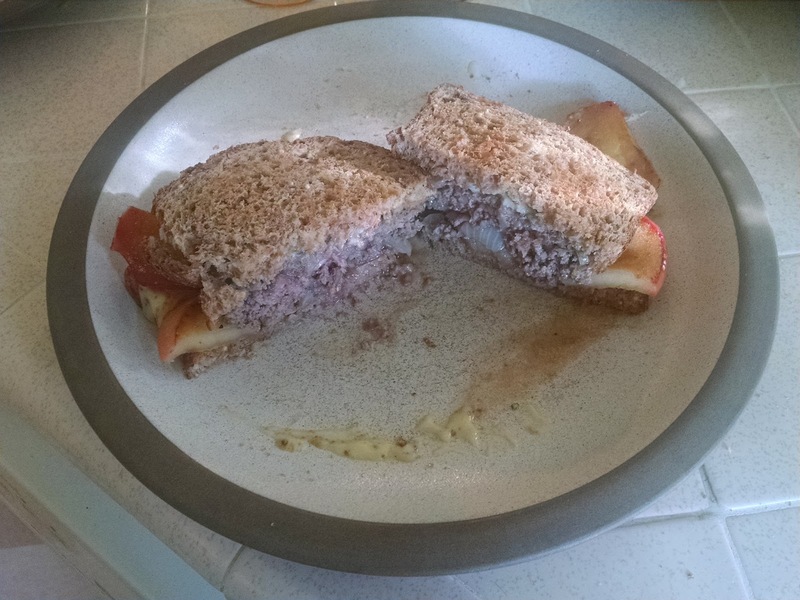 He applied gorgonzola cheese to the patties to allow the cheese to melt while the patties rested. You could also add the cheese to the burgers while they are on the heat, but just cover the plan with a lid or foil as the steam will help melt the cheese. Finally, the time had come to build the burger. We grabbed our buns, which in this case was sandwich bread, but you could use any other bread/bun option you like. You could even omit the bread all together if you wanted. On the bread goes the condiments of your choosing, but may I recommend some homemade mayo and some good dijon mustard to start? Place 3 to 4 slices of apple on one side of your bun and sprinkle with a little more brown sugar. Place the patty on top of the apples slices thusly. Add your top bread and eat the extra apple slice. Wait….what? Yes, quality control is always important. So, make sure you taste everything! When you are finished you should have something that looks like this. This is absolutely the best! Enjoy! Just a minute…………you didn’t think I was going to leave you with just that did you?? You were right. How about I leave you with this photo instead? Here you can see all the elements of this burger. There is the mayo, the cheese, the bits of onion running through the meat, and finally, the apple. As I ate the burger I couldn’t believe the amazing flavor that was coming through with every bite. This burger had everything I could have imagined. It was sweet and tart from the apples and sugar, had a little crunch and texture from the onion, some beautiful richness from the cheese and meat, a little zing from the mayo, and a bit of earthiness from the pockets of gorgonzola. All of that formed into a symphony of perfect bites. I was floored. My Dad just watched me eat for a few minutes as my brain and palate danced with some spectacular flavor. As hard as it was to fathom, this unlikely combination was nothing short of a knock out. However, one question remained. Where did he land on this recipe and why hadn’t we known about this before? It turned out that he had seen an article and a recipe by renowned chef, restaurateur, and cook book author, Hubert Keller. Keller is considered by many to be a legend among men when it comes to proper burger basics and techniques. In fact, at one of his restaurants in Las Vegas, the ingredients for one burger are so treasured that the total cost of the burger is about $5,000.00 dollars!!! If you are curious, follow this link to learn more about Keller, http://www.hubertkeller.com/. My Dad told me had made it a few times before and was never disappointed. Use ground beef or any other meat if you can’t find or don’t want the buffalo as your protein. However, the benefit to using the buffalo is that this a much leaner meat than ground beef. Keep in mind, that just means you will have to watch to make sure your burgers don’t get over cooked. That is the reason for the onions as they add a little moisture as well as a little flavor. You could make this a veggie burger option and still would have a spectacular burger. As usual, feel free to substitute as you see fit. Heck, you could even just cook the apples and melt a little cheese over it and that would make an amazing snack or part of nice end to a meal. 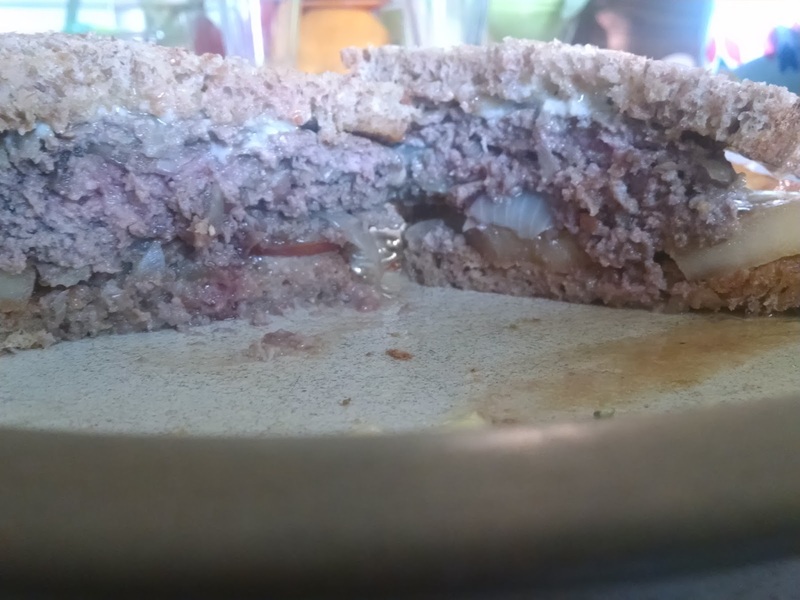 Lastly, I have included the recipe so you can have a little more detail on how to bring this burger together by clicking on this link http://www.hubertkeller.com/recipes/mod/recipe_309SignatureBurgers.html. We made a few changes, but they were related to our choice of herbs and breads we used based on what we had at hand. There it is. This is the most unique and flavorful burger I have had. I hope you think so too! Feel free to send me an email about your thoughts on this, or any other recipe that I have shared. I can’t wait to hear what you think!